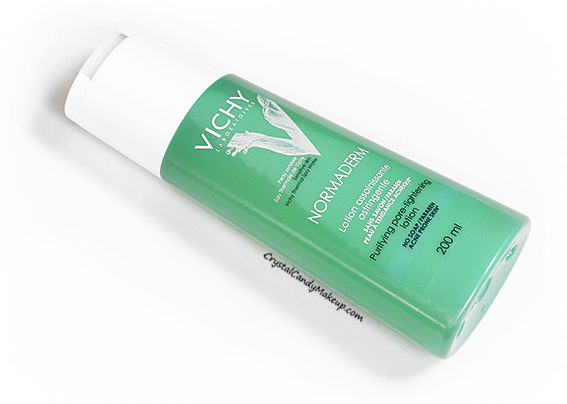 Crystal Candy Makeup Blog - Review and Swatches: Vichy Normaderm Skin Care Routine + Giveaway! 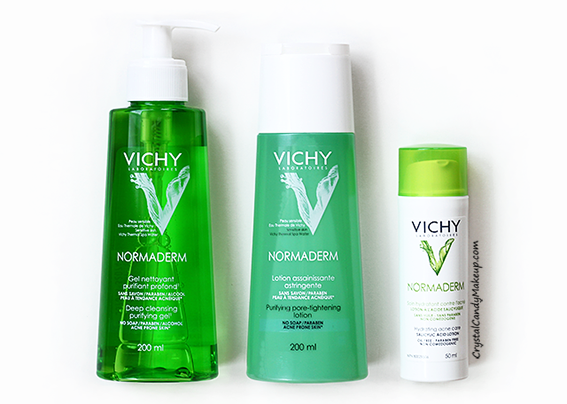 Vichy Normaderm Skin Care Routine + Giveaway! I've always had acne, but my skin has been breaking out more than usual lately. I'm not sure if it's because my hormones are completely messed up or because my skin is usually worst during the summer, but I had those big painful bumps that took forever to get rid off. 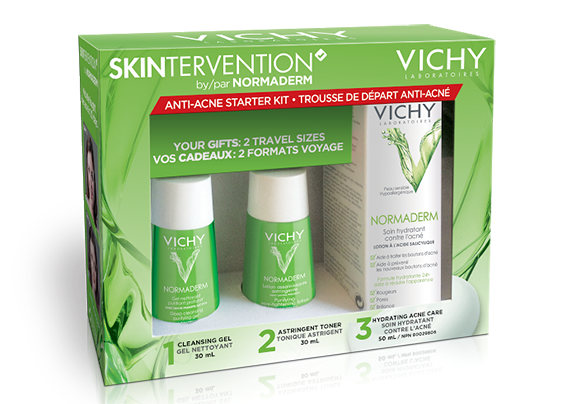 So I thought it was the perfect timing to do the 30-day Skintervention Challenge with some Vichy Normaderm products! All these products are paraben free, soap free, hypoallergenic and contain Vichy thermal spa water. This face cleanser contain salicylic acid, glycolic acid, totarol and eperuline. These ingredients have purifying, antibacterial and soothing properties. I need such a tiny amount, it makes a lot of lather and removes every trace of makeup, sebum and dirt. This bottle will last me a good 6 months and I use it twice a day! It's very effective, like my NeoStrata clarifying gel, but it's less drying and doesn't irritate the skin under my nose (I get eczema there if I use products that are too drying). By the way, my boyfriend used this cleanser a couple of months ago and love it too! Oh and the pump is great! I rarely use toners, I don't feel the need to do so and some of them leaves a sticky residue that I can't stand (hum hello, Sothys Purity Lotion). This one is less heavy, it does leave a slightly sticky film on my skin but it's not that bad. I don't know if it's this toner or the cleanser and lotion that helped my skin, but I noticed less clogged pores on my chin which means less breakouts too! I did have some minor breakouts but no painful cystic acne while I was using these 3 products. Despite the fact that the second ingredient is alcohol, this toner doesn't dry out my oily skin at all. I've never used a lotion with salicylic acid, so I was quite excited to try it! It contain glycolic acid, salicylic acid and LHA to help reduce the appearance of imperfections. The texture is like a gel-cream and it smells fresh and clean. They say that it's an excellent makeup base, but to me this is just a moisturizer for acne-prone skin ; it did nothing to control oils, reduce the appearance of pores and my makeup did not last longer. I'm a bit confused by this claim because it also has a tendency to balls up with some foundations. That being said, it did prevent new breakouts, hydrate and improve my skin texture (thanks to the glycolic acid!). I'm not sure if I would purchase it again though because the purifying gel and lotion are quite effective on their own, and I would rather use a moisturizer that works well with any foundation. Now it's your turn to take up the Skintervention challenge! Just follow the steps below and you will get a chance to win this Normaderm Anti-Acne Starter Kit! 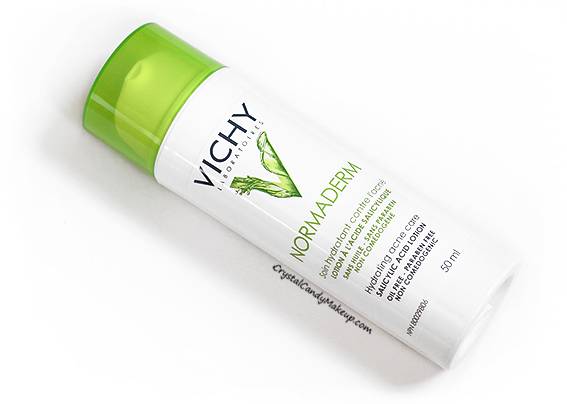 I haven't tried anything from the normaderm line YET, but I use a bunch of other Vichy products, and they are amazing! No, I haven't tried these products yet but would love to as I suffer from acne. I've tried the cleanser, and love it!! I really want to try the other products from the line! I haven't tried these before.. but my skin has been awful lately. So I'm looking forward to it! I haven't tried these products yet but they look great! 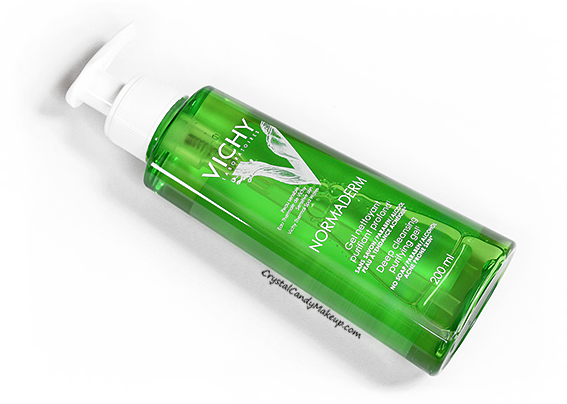 I have never tried Vichy products before. No I haven't tried it before. I love Vichy products in general. I use Normaderm gel and the night lotion on regular basis. Awesome products!